X-Small (2-4) - £20.99 Small (6-8) - £20.99 Only 1 left! Did you know that honey is the only food humans eat that is made by insects? The ingredients of the sweet treat are pretty simple, everything that's sweet and colorful about flowers. In a way, honey is a pretty magical food. Without honey bees floating from flower to flower those plants wouldn't have a way to reproduce. So really, we have a lot to thank the bees for. Now, we're not sure if the bees will understand that we're grateful even though they are pretty smart. they have to learn what flowers to go to in order to make honey in just a matter of weeks! The thing is, we're pretty sure they don't speak English and we certainly don't speak bee, though we've tried. Try it now, don't worry about what people might think of you! You're sure to find buzzing quite freeing. It's sure to take a while to conquer the bee's intricate language but in the meantime, let them know you're an Ally by dressing up in this adorable costume! This honey-sweet ensemble is made up of a black and yellow tank dress and has a fluffy black skirt made of layers of tulle. 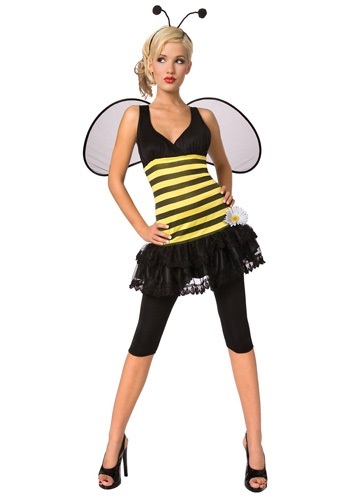 It also comes with wings, antennae, and a pair of leggings. You're sure to cause a buzz with the eye-catching antennae that are attached to a headband and topped with soft fabric balls. The leggings are comfortable with an elastic waistband. You'll look fly in the sheer, dark wings. Now you won't have to worry about any bees stinging you! In fact, they're sure to find your efforts rather sweet!